Hoops and Stars, Inc. is committed to enriching the lives of the developmentally disabled and their families and caregivers by providing programs that afford them opportunities to live every day with purpose and passion. We are committed to cultivating awareness in our community of the talents, abilities and compelling needs of the disabled population. Through HoopStars Basketball, we strive to provide programs that instill a sense of accomplishment, teamwork and competition, as well as providing physical activity and enhancing self esteem. In 1997 a grass roots effort began with five developmentally challenged children who wanted to play basketball. No such program existed for the game of basketball so they began their own. They initially played on Sunday afternoons at the Fullerton Boys and Girls Club. 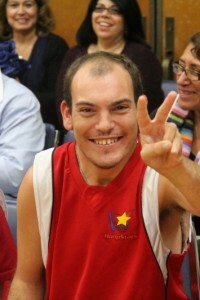 As word of mouth spread more and more players joined and HoopStars was born. HoopStars moved to the First Evangelical Free Church of Fullerton’s basketball gym to accommodate the growth, more coaches volunteered to help, and a board of directors was formed. The league was solely parent funded until 2003 when Hoops and Stars, Inc. incorporated as a 501 (C) (3) nonprofit organization. HoopStars has evolved beyond just providing opportunities for players. Programs for caregivers and families such seminars on guardianship, trust funds, respite care, family issues, etc. were incorporated in 2006. We are a volunteer organization with no paid staff or otherwise compensated individuals providing services to over 400 players and their families in three cities, Fullerton, Anaheim, and Pomona Valley. Copyright ©2019 Hoops and Stars, Inc. All rights reserved. Hoops and Stars, Inc. (DBA HoopStars) is a 501 (c) (3) Corporation EIN 20-0297811.